Obehosting Review 2019: Is Obehosting a Good Hosting? Obehosting provides a small selection of enterprise-level hosting services including colocation and dedicated servers. Founded in 2012, but part of an internet company that was founded in 2008, they own their own data center in Sweden. Hosting provider Obehosting has been in business since 2012, but is part of the Obenetwork internet company that has been in business since 2008. They own and operate their own server hall in Stockholm, Sweden. Their simple website is available only in Swedish, but it translates quite nicely into English in the Chrome browser. Obehosting owns and operates its own data center in Stockholm, which has fully redundant cooling and power. They don’t advertise their uptime, but as data center owners they should be able to respond much quicker to issues, and there is much less risk that they will oversell their resources. Obehosting does not sell shared hosting; they only sell colocation and dedicated servers at their Stockholm data centers as well as centers in Malmö, Gothenburg, Oslo, Amsterdam, and London. There are two dedicated server plans: Value Server (Supermicro hardware, 4GB RAM, 250GB SATA storage, 5TB traffic, one IPv4 and one IPv6 address) and Premium Server (HP DL320e G8 hardware, 8GB RAM, 120 GB SSD storage, 20TB traffic, 29 x IPv4 and 64 x IPv6 addresses). If you want a custom dedicated server package, you can’t configure and purchase it online, but you can contact the company. Unusually for enterprise-level hosting, they do advertise their okay prices (not too cheap, not too expensive) on their website. Obviously, you’re paying the price of working with a company that owns its own center. The prices are listed per monthly in Swedish krona, but you can’t purchase any plans online. Instead, you have to click a “Contact us to order” link that takes you to a generic online contact form. It’s inconvenient but is not a dealbreaker for me. Support can be obtained by telephone or email, from 10.00am to 5.00pm on Mondays through Fridays. Combined with the fact that they have no knowledge base or other online resources, this makes their support provision very limited. I’d usually like to see better business hours, a help center, and live chat, but I guess this is a different kind of hosting company aimed at established corporates or resellers rather than mass market retail customers. 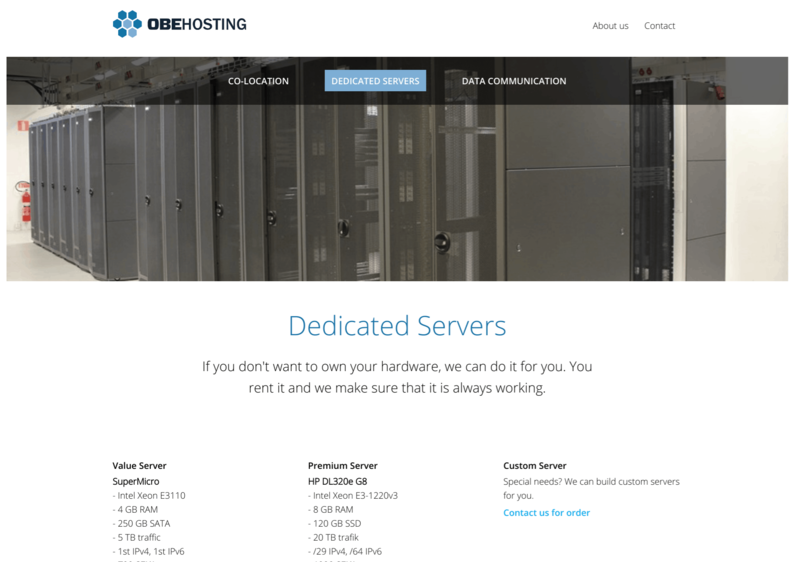 Obehosting has a minimal website with a limited number of enterprise-level plans. Not for mass market retail customers, this provider may be better suited to advanced users who want the security of a company that owns its own Swedish data center(s). Wondering how Obehosting stacks up against other Web Hosting companies? Enter any other Web Hosting company and we will give you a side-by-side comparison.